Men with wider faces, such as TV mogul Simon Cowell, are deemed less trustworthy than thinner-faced men, a study has suggested. St Andrews University experts had 285 men play a computerised game for money. The game offered players chances to trust other participants, but also opportunities to exploit them. An expressionless photo of a fellow player's face was shown at the start of each game and the men had to decide whether to trust them or not. 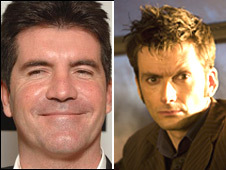 Lead researcher Michael Stirrat said he found participants were more likely to entrust money to men with narrower faces, such as former Dr Who actor David Tennant. Mr Stirrat said: "We all make instant judgements about strangers, whether to trust him or whether to be wary of her. "From the evolutionary theory of sexual selection we predicted that male faces may signal physical dominance and that more dominant men would be more likely to be exploitative because they can be. "We found that men with wider faces exploited trust more often to make money for themselves." However, he added: "The results are important but we shouldn't leap to the conclusion that wider-faced men are bad. "They were exploitative in our games, but in other games the wider-faced men were more likely to sacrifice their money to enforce good behaviour.